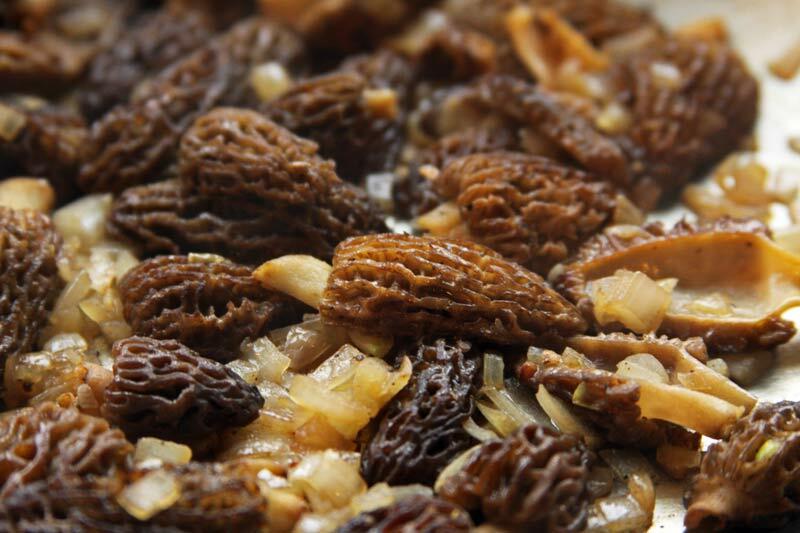 There is no finer fragrance than the mouthwatering aroma that rises from a sizzling pan full of plump, savory morel mushrooms. Morels don’t need a lot of fancy preparation to be at their best. Morels, cooked simply in butter, are full of rich, earthy flavor. They need nothing more than a sprinkle of salt to bring out their remarkable taste. With morels, less is most definitely more. 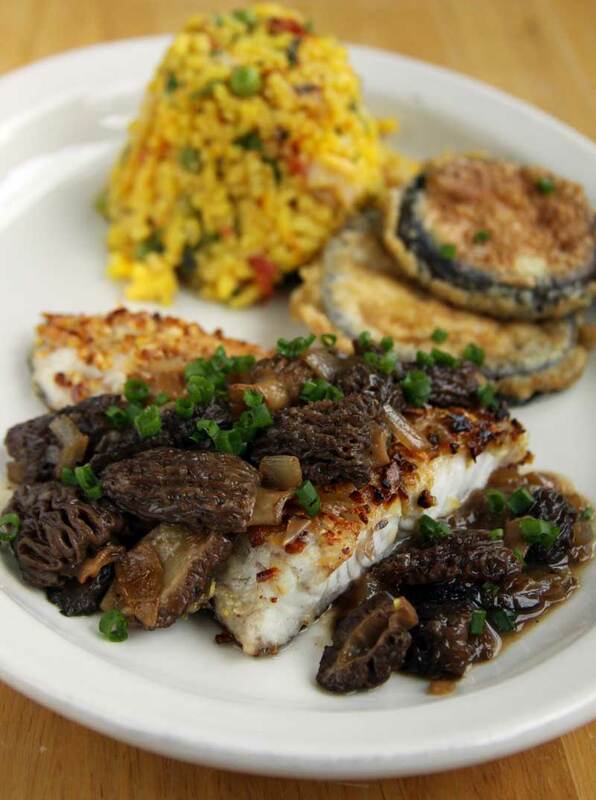 Morels and walleye are a natural pairing. The walleye, sometimes known as “walleyed pike,” is a prized gamefish found throughout the Great Lakes and in lakes and rivers in the northern US and much of Canada. The white flesh of the walleye is firm, meaty and delicious. Like trout and other species of freshwater fish, it seems to go particularly well with mushrooms. Traditional preparations for walleye frequently rely on batter coating and deep-frying, which mask the delicate flavor and texture of the fish. How sad! 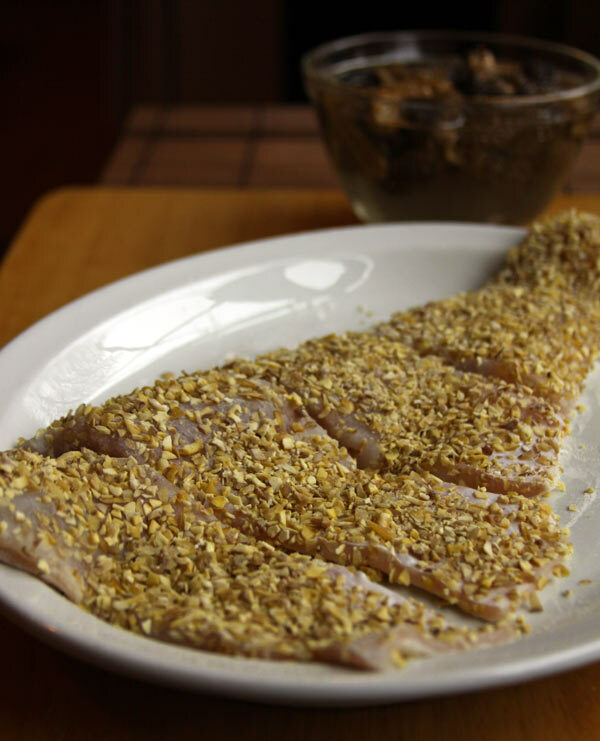 Instead, the fish is coated with a layer of chopped chestnuts. 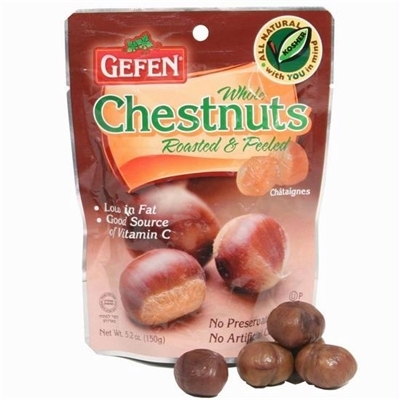 Chestnuts, which contain absolutely no fat, create a light, crisp golden-brown crust and add a wonderfully nutty flavor and tender crunch. These three ingredients, fish, chestnuts & morels, harmonize together to create an uncomplicated dish with flavors that are simple, yet profoundly satisfying. Cut the walleye into pieces, each approximately 4 oz. Put cooked chestnuts into a food processor and pulse briefly until the chestnuts are cut into bits approximately 1/8 inch in size. Spread them evenly on a large plate. First, dust the skin side of the fish with flour, then turn it flesh-side down onto the chopped chestnuts. Press gently. Turn the fish back over and pat any loose bits of chestnut firmly onto the flesh. Refrigerate for 15 – 20 minutes – the chestnut bits will adhere more securely to the fish. Meanwhile, split the morels lengthwise and immerse in a bowl filled with cold salted water. About 2 Tbsp kosher salt per quart of water should do the trick. Normally, it’s not necessarily recommended to soak or wash fresh mushrooms, but any experienced morel hunter will tell you that it’s something of a necessity with morels. The idea is to 1.) loosen any dirt or debris from the honeycomb structure of the morel and 2.) flush out any unwanted buggy hitchhikers (they don’t like salt). Gritty morels are just no fun. The bugs I don’t mind so much. 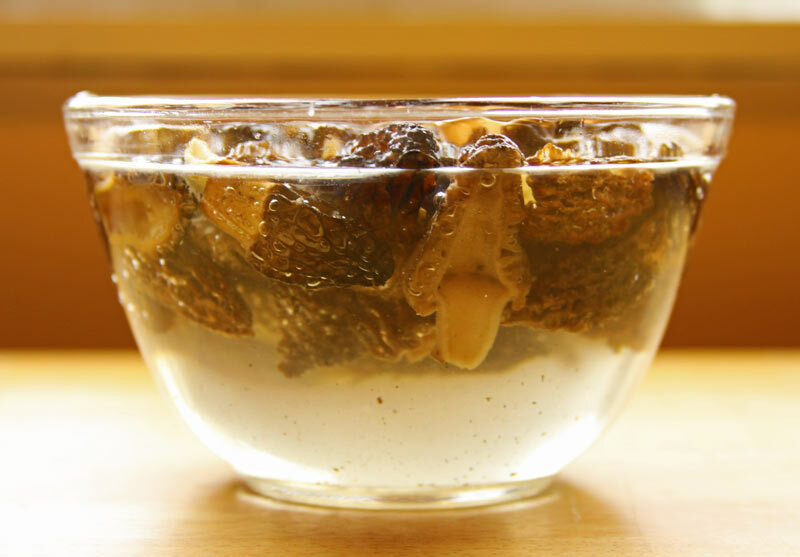 Soak the morels for about 15 – 20 minutes, lightly agitating the mushrooms in the water from time to time. 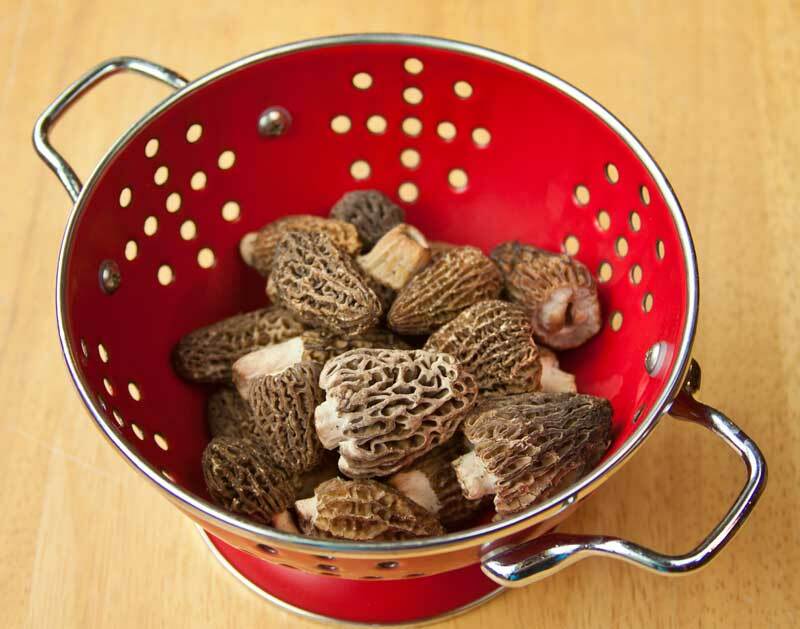 Drain the morels in a colander and gently flush them with cool, running water to remove any residual debris. You’ll probably see a trace of dirt and grit in the bottom of the sink. Once the morels have been thoroughly rinsed, place them on a towel to drain completely. Heat 1 Tbsp of butter in a large skillet over medium high heat. Add the shallots and cook them, stirring frequently, until they begin to soften slightly, about two minutes. Now add the morels and cook for another 5 minutes. Reduce the heat to medium, and stir in a generous pinch of flour (about 1/8 tsp). Add the dry sherry and continue to cook until the sherry is reduced by 2/3. Stir in the soy sauce and reduce the heat to medium low. Swirl in the remaining tablespoon of butter until the sauce bubbles and thickens. Adjust the seasoning to taste with salt and pepper, then remove from the heat and set aside. Heat the oil over medium high heat in a large saute pan, big enough to accommodate all the fish pieces without crowding. Use a good quality cooking oil. Personally, I prefer to use grape seed oil because of the high smoke point. It’s nearly impossible to make it smoke (believe me, I’ve tried) and cooking at high heat really helps to get a nice golden brown crust and crisp skin on the fish without overcooking it. Once the oil is good and hot, place each piece of fish flesh side down in the pan. Reduce the heat slightly and cook for about 2 minutes or until the chestnut coating is a rich golden brown. Carefully turn the fish, and cook for an additional 2 – 4 minutes or until the skin is crisped and the flesh is just cooked through, but still moist. Remove each piece of fish to a warm plate and top with a generous spoonful of the morel sauce. Be prepared to serve seconds. This sounds absolutely delicious. I agree with you about less is best when cooking with morels. Where can one purchase walleye? (unless you are lucki enough to have friends who are game fishers}. If you can’t catch your own walleye, don’t worry. While the US doesn’t have a commercial walleye fishery, Canada does, and fresh walleye can frequently be found at many of the better-stocked fish counters. I LOVE finding such amazing recipes using morels!!! Fabulous recipe!! Morels AND chestnuts, I’m sold! If I lived in Michigan I would definitely try that coating on walleye, here in the Pacific Northwest I’d probably use cod. Lots of intriguing ingredients in this recipe.